WISER recently had the privilege of conducting a tour for the President of the Republic of Tatarstan, Rustam Minnikhanov and several members from his country's delegation, as well as members from the Kazan Federal University. 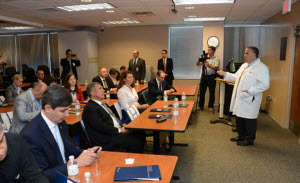 The purpose of this tour was to highlight the advancements in healthcare education as well as an introduction to the opportunities that the City of Pittsburgh has to offer. 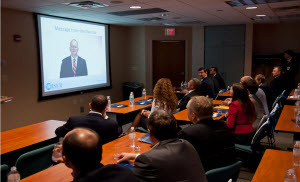 Tom Dongilli, WISER's Director of Operations, conducted a brief presentation about WISER and then guided the group through an interactive, hands on tour of the facility. 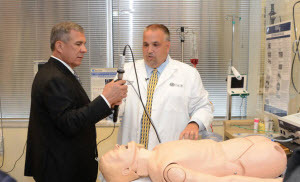 Assisting with the tour was Kevin Miracle, Manager of Simulation Services. 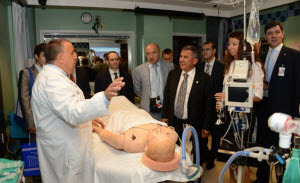 The tour provided an in-depth overview of WISER capabilities as well as demonstrating training exercises health care students and practicing healthcare professionals. This tour was conducted as a joint effort between WISER and iCarnegie.